Following the Spireites home and away is part of my life. Over the years, I have become friends with many of the Chesterfield. I was named fan of the year at the 2014 Player of the Year Awards. The Chesterfield FC Community Trust named the sports hall at the Proact stadium after me in recognition of my sporting achievements. I was chosen to represent the club at the EFL launch in 2016. I’m not sure when my love for football and the Spireites began because I can’t remember not knowing about football. My Uncle used to take my mum to Saltergate when she was about 7 and my dad’s been a supporter since he was 9. Therefore, football was bred in to me from an early age. I can honestly say that I was born true blue. I didn’t breathe for 16 minutes! I’ve been going to Chesterfield matches on and off since I was 5 years of age. I didn’t get to as many matches as I would’ve like to during my sports career, but when I retired from my sport all I wanted to do was become a full time Spireite. On May 4th 2014, I won Chesterfield’s “Fan of the Year” award. I was really shocked, emotional and amazed that I had won it. I still find it hard to find words to describe how proud I felt when it was announced that I had won it. I am so proud to win this award, I feel really special, and it was just fantastic. I’ve done some great things in my life but this goes at the top, alongside winning my Paralympic Silver medal. I have enjoyed had a 2 page spread all about my sports career in the Chesterfield FC Match Day programme. I thought this was a wonderful gesture on the part of the club. Once a Spireite, always a Spireite and I love all my Spireite boys past and present. Of course, I love to see the team win and being successful. However, win, lose or draw and whether they are top, middle of bottom of any league, I’ll be there to support them. The only time when I don’t attend is when I’m really ill or when I’m on holiday. I even try to work our holidays around the matches. My favourite Chesterfield Player of all time is and will always be super Jack Lester! Jack is fantastic with me, he is a brilliant person to know and I’m proud to say, he is a very special friend in my life. I love him loads, he’s my number 1 man! I had my 40th birthday party at the Proact Stadium. Some very special guests attended. This included most of the directors of Chesterfield Football Club, the Chief Executive Chis Turner, most of player at that time and my all-time hero Jack Lester! I wanted to be a footballer since I was 5 years old. They didn’t have mascots back then. I’ve only ever had 1 regret in my life and that’s I never got to be a mascot for my beloved Spireites. All that was fixed the week before my 40th birthday when I got the best and biggest surprise of my life. Just a few seconds before the players walked out for the match. I was informed that I was going to be Match Mascot. I flew on to the pitch, I thought “I’ve been wanting to do this for 35 years, there’s no way anyone’s stopping me getting into that centre circle” I got a standing ovation from the crowd. This just felt unbelievable! When I found out about the Chesterfield FC Community Trust naming their sports hall after me, this was also amazing, unbelievable and an emotional surprise for me, “The Zoe Edge Room” to mark my sporting life and my love for CFC. I am extremely proud to receive this great honour! At that time I was 40 years old and my answer was “I’m only 40, I’ve got a lot of living to do yet!” All this has inspired me, more than ever to keep living my life the way I believe and to keep doing everything my way. I wasn’t born to live a normal life. I’ve always believed I was born to be different. I will keep pushing myself to the limits and I’ll keep trying to do the unexpected. I never quite know what I will do next, but I’ve always got ideas!!! 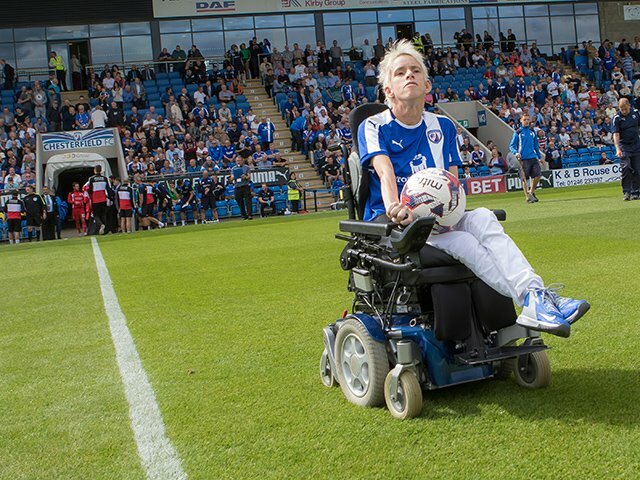 Chesterfield Football Club are and have been fantastic with me for so many years!